27-09-02: 'Midnight Blue' X "MORsoul". The latter is an unreleased Moore hybrid from 'Anytime' X R. soulieana. It was one parent of Ralph's lovely little 'Baby Austin'. This was a huge surprise, color wise. I selected 'Midnight Blue' knowing that if anything could add color to a cross that might bleach out to pale pinks or peaches using most any other parent, 'Midnight Blue' could. I guess I wasn't wrong! 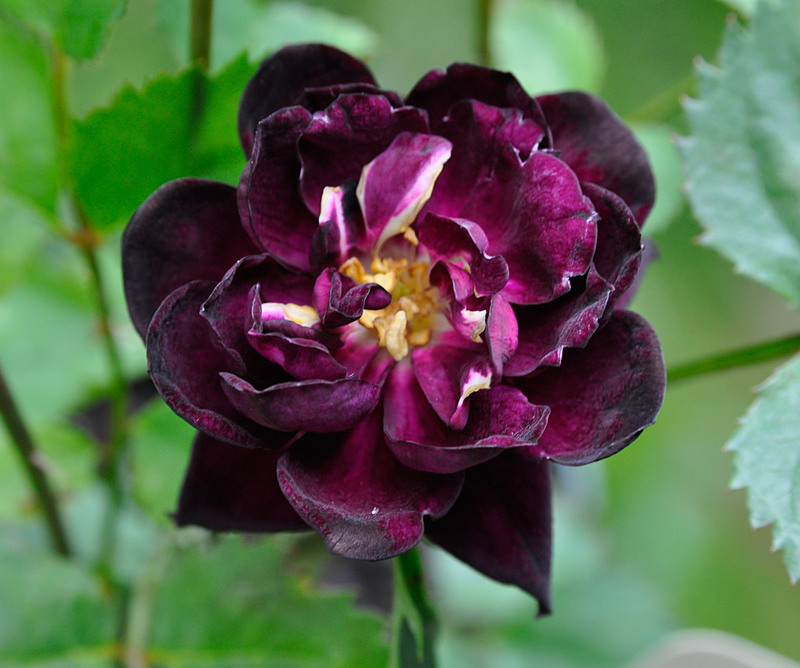 This is the second selection that has bloomed in a very dark color. Much darker than anything I imagined possible. I wonder if it has anything to do with the fact that R. soulieana is represented on both sides of the parentage equation? Hmmm. Bloom form is a bit disorganized, but that might right itself in time. It is already forming the next blooms just as the first is opening, and lots of new growth is appearing from the base, indicating a potentially shrubby, compact habit. Oh, and yes....it has a fragrance too. Fun, eh wot? Parentage: 42-03-02 X R. foliolosa. This is a strikingly pretty red single, presumably a diploid, selected for further breeding. It appears very eager to set seed and hopefully I will start to see repeaters in the next gen. Very healthy plant! This is making me very pleased to have started over at the species level. 2010 was the first time I had seen seeds form on R. wichurana variegata, aka 'Curiosity'. Needless to say, I gathered these promptly and set them in the fridge to stratify. What you see here is the result: green. No variegation of any kind; not even a hint. While disappointed, I can't exactly feign surprise, since the odds were good that the variegation, although genetic in origin, would not be inheritable. This suggests the factor is a sport/mutation that does not extend into the reproductive tissue layer, and so it won't get passed on to offspring. Pictured here is 87-09-01, a seedling from the 2009 cross of two species; R. soulieana and R. foliolosa. Both of my specimens are, I presume, diploids, and so I expect my seedlings are also. The cross was made with the idea of combining two very hardy, very healthy species while remaining strictly within the diploid realm. The foliage, as I have noted in a post last year, is fragrant: somewhat like Raspberry and Pine combined. The plant has been immune to mildew and I would expect it to be similarly resistant to blackspot. (I won't know till later this year) The blooms, while unremarkable, are already being borne in large clusters on this 2 foot tall arching plant. Some panicles have over a dozen buds. Not surprising, given the parentage, the color is a soft "apple blossom pink" hue, and there is a modest scent. Once there are more blooms of 87-09-01 open I might offer pollen to my colleagues, if interested. 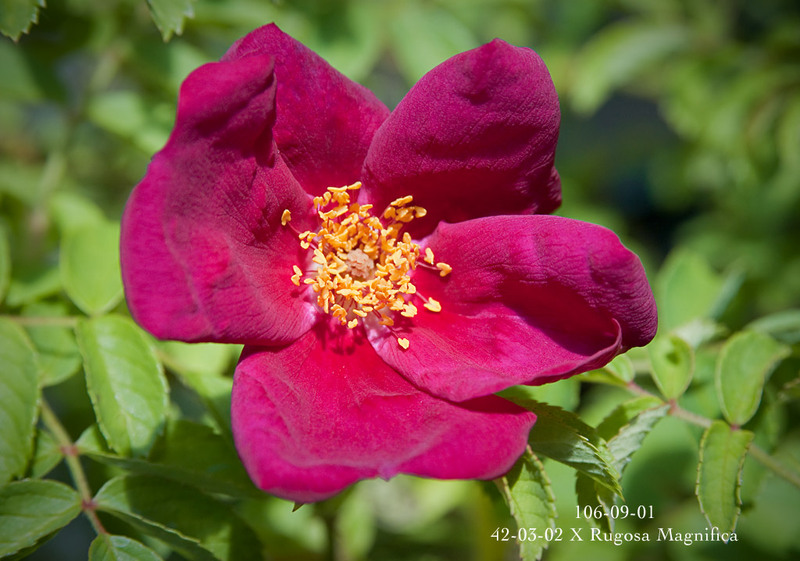 R. soulieana imparts great health, vigor and beauty to its offspring and this could be of value to other hybridizers. Seedling 87-09-02, while seemingly as healthy and vigorous as 01 last year, has not been as nonchalant about our long, cold spring; its foliage has been "troubled" and the first round yellowed and dropped off. A sign of something I don't want to bring into a breeding line? Perhaps. I will watch it as the season develops. Many roses I grow here struggle to produce normal foliage until the weather settles into a warming trend. 106-09-01, looking for a way to breed useful Rugosas. Once in a while you happen upon a seedling that is willing to do some neat tricks for you. Serendipity plays a huge role in choosing which seedlings I save for evaluation. I don't dare think about all the thousands of seedlings I have discarded that may have harbored secret capabilities. Alas, we work with the ones we feel have potential and let the proverbial chips fall where they may. I've often pondered Ralph Moore's work with the Rugosas. 'Rugosa Magnifica' (van Fleet) was once Ralph used often, as well as 'Belle Poitvine' and various selections of R. rugosa rubra. I am aware that Ralph often disregarded ploidy when choosing what crosses to make and I have come to feel that there are definitely occasions when matching ploidy is potentially beneficial. 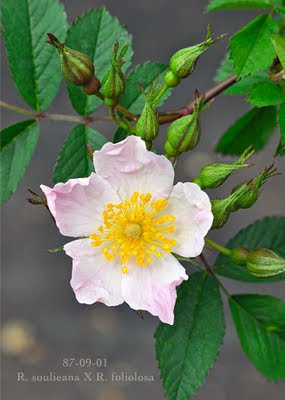 For instance, this year I am flowering out a group of diploid hybrids made with 'Therese Bugnet', most of which involve R. foliolosa or one of its hybrids. These were created with attention to matching diploid-to-diploid. More on these in a coming update. I hope this little shrub (it is still only 15" by 15") will grow up to be something pretty, because I think a 3 by 3 foot mature specimen loaded with flushes of these richly colored blooms would be remarkable. With its parentage, I would expect superior disease resistance as well. We'll see!